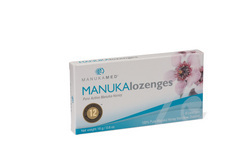 New MANUKAlozenges® from Links Medical Products, Inc., Irvine, CA, offer sore throat relief. Contain 100% medical-grade Manuka honey to calm, soothe, and heal irritated and sore throats. All-natural, great-tasting and package displays seal of the Molan Gold Standard the internationally recognized certification of authentic Manuka honey. Featuring the seal of the Molan Gold Standard™, the internationally recognized certification of authentic Manuka honey. Extensive research demonstrates the safe, powerful, natural healing properties of 100% medical-grade Manuka honey. Irvine, California, May 5,2010 — Links Medical Products Inc. (LMP), a leader in the manufacture and marketing of innovative, healthcare products for use in both acute and long-term care, announces the launch of new MANUKAlozenges Sore Throat Relief. MANUKAlozenges are part of the new line of ManukaMed® brand of medical-grade Manuka honey products to maintain general health and well-being and to treat and manage burns and wounds. All-natural, great-tasting MANUKAlozenges contain 100% medical-grade Manuka honey to calm, soothe, and heal irritated and sore throats. Extensive research shows that Manuka honey offers powerful bacteriostatic1 and antioxidant2,3 properties to help promote healing; anti-inflammatory1 properties help reduce swollen glands and pain. MANUKAlozenges have a certified Molan Gold Standard of 12. The Molan Gold Standard is the internationally recognized certification of authentic Manuka honey. It is named for the pioneer researcher in the field, Professor Peter Molan, MBE. The Molan Gold Standard is licensed only to companies meeting Professor Molan’s standards for identifying and measuring the medicinal activity in Manuka honey, so it allows consumers to readily recognize authenticated medicinal Manuka honey. MANUKAlozenges are made by dehydrating Manuka honey through a special process that maintains the honey’s unique medicinal properties. The result: a pure, natural lozenge that dissolves slowly in your mouth, while calming, soothing, and healing sore throats. In addition to MANUKAlozenges, the ManukaMed brand of products include MANUKAhoney® Medical-grade Manuka Honey for numerous health conditions, MANUKAbalm® Lip Therapy, MANUKApli® Sterile Wound Dressing, and MANUKAderm® Skin Protectant. LMP and their New Zealand partner ensure complete traceability and control over the production of its ManukaMed brand of medical-grade Manuka honey—from beehive to final product. This level of control is unique among Manuka honey companies who often buy honey on the open market or contract with multiple suppliers who do not have rigorous controls. LMP and their New Zealand partner also guarantee a reliable supply of medical-grade Manuka honey for its ManukaMed line of products through access to the Manuka forest; a long-term, relationship-building policy with landowners; and the development of new Manuka groves. Together with the New Zealand government, the company has pioneered a school for beekeepers to ensure essential skills are maintained and improved. In addition, every step in the production chain is carefully considered to ensure the ManukaMed brand of medical-grade Manuka honey products meets the highest standards. In association with medical professionals, Links Medical Products has developed stringent test methods for medical-grade Manuka honey. To order MANUKAlozenges or any of the ManukaMed brand of medical-grade Manuka honey products or for more information, please visit the Links Medical Products website: http://www.linksmed.com. You can also call 888.425.1149. About Links Medical Products Inc.
1. Pieper B. Honey-Based Dressings and Wound Care: An Option for Care in the United States. JWOCN 2009;36(1):60-66. 2. Molan P. Honey: Antimicrobial Actions and Role in Disease Management. In: New Strategies Combating Bacterial Infection. Edited by Ahmad I, Aqil F. WILEY-VCH Verlag GmbH & Co. KGaA, Weinheim, 2009. 3. Molan P. Why Honey Works. In: Honey in Modern Wound Management. Edited by Cooper R, Molan P, White R. Wounds UK Publishing, 2009.